Well, you guys, it’s taken me all week to get this post finished. It was one of those weeks—the kids passed a fever back and forth which has now landed squarely on me (waaah), and all plans, best-laid or otherwise, toppled like dominoes. Oddly enough though, I already knew I was going to write about things gone awry. Mostly we get derailed and frustrated by small things, and I find myself thinking, “as soon as X crisis is over and we get Y under control, I can really start to Z.” It’s taken me years to realize that the variables X and Y are just that, variables with an infinite number of possible substitutions, and that if we are waiting for the black hole of quietude to emerge from the chaos, we are not only never going to get to Z, we’re going to miss the whole beautiful chaotic universe. If we focus only on the fact that the kid is drawing on the wall, we miss that this is the first time she’s ever drawn a face. And that said drawing comes complete with a scribble she points to and says, “that’s his throw-up!” You know—this is the good stuff. That said, I am all about finding comfort, soothing our rumpled egos when our plans get trampled yet again. One of my favorite meals as a kid was Noodles and Eggs. This is not, as Google might suggest to you, a pasta frittata with some parmesan, or stir-fried ramen with eggs and soy sauce (though those sound pretty good), but rather cooked egg noodles tossed into a buttered skillet, a few eggs hastily cracked in, sprinkled with garlic salt, and plunked in front of happy kids, usually with a jar of applesauce on the side. There’s a passing resemblance to lazy pierogi, but only if you could call it “extra lazy extra simple lazy pierogi.” I clearly remember happy shouts going up the times my sisters and I asked about dinner and were told it was Noodles and Eggs. Flash forward to my thirties, when I got interested in making things like red wine mushroom sauce or balsamic strawberries (ah, the late ’90s! ), and I asked my mom how to make Noodles and Eggs. She burst out laughing. 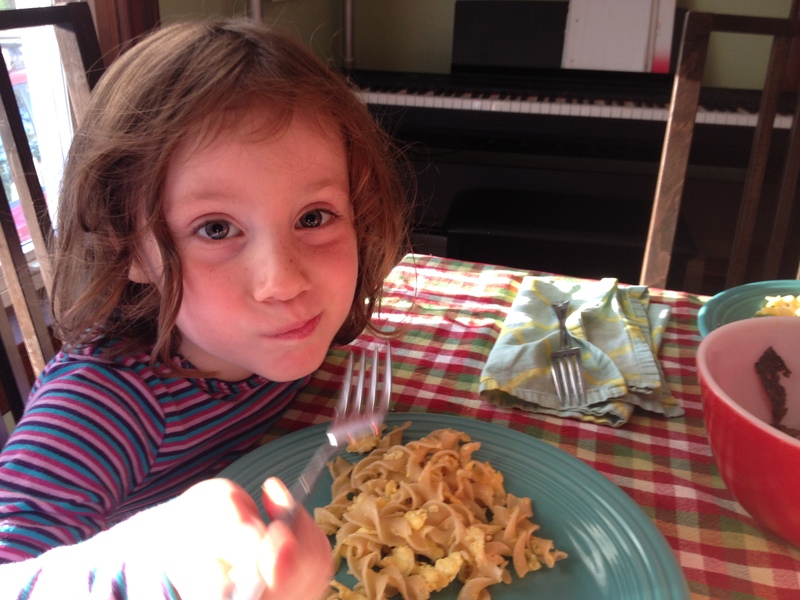 “What do you want to make Noodles and Eggs for?” She explained that Noodles and Eggs was “Depression food,” what you made when there was no time or energy for anything else, or you were eking out another day or so before the next paycheck and grocery run. “Really?” I asked, and explained to her how much I loved Noodles and Eggs, that it was a comfort food to me, and I’d never seen anyone else make it. I haven’t thought of them for a long time since then. Then Monday happened. Poor Stella was nearly impossible to extract from her nap so we could drive across town and pick up second grader Sophia. I carried her downstairs, still shoeless and sleepy, and strapped her protesting frame into the car seat, already running behind. While trying to parallel park at our (beautiful old) downtown school building with no parking lot, I promptly got blasted by road rage. The driver behind me yelled, revved her engine, and promptly pulled left around me, up over the sidewalk, roaring across the grass over to the street corner, causing another mom to yank her kids out of the way. Shaken, I reported the incident to the police, in disbelief that adults could behave that way in a schoolyard. Finally, ten minutes after the bell, I put Stella’s shoes on and pulled her across the playground to find Sophia. There she was, running toward us, crying. Oh no, I thought. She was worried because we were so late. “I have the chills!” she sobbed. It was her turn to have the fever. We all limped back home, feeling bruised. And I thought of Noodles and Eggs, which I’d forgotten how to make. They just popped into my mind again, and I understood them from the other side for the first time, the perspective of the exhausted parent. Pulling dinner together while monitoring the supply of children’s Tylenol and brokering deals between the kids about who picks the PBS Kids show they get to watch. Straining noodles in a colander over a sink still full of dishes from breakfast. 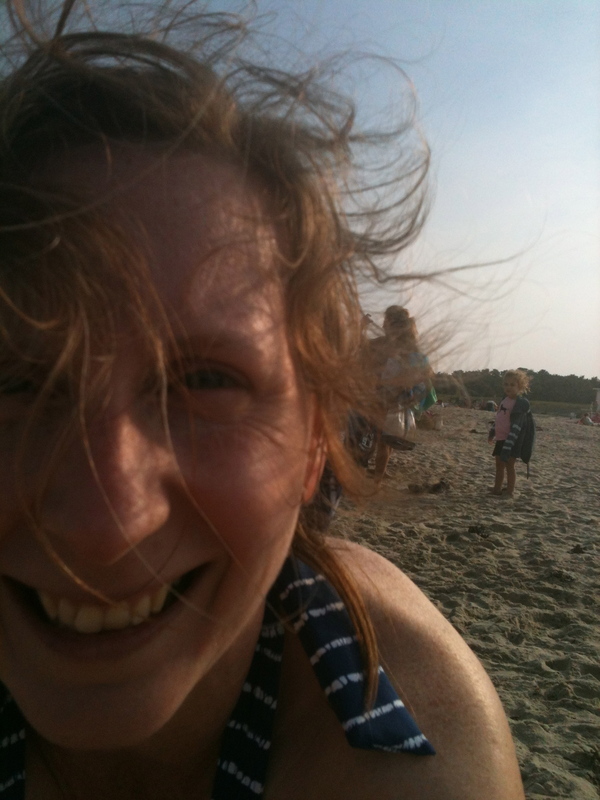 The thought went up then, like a prayer, that maybe, if I was lucky, my kids would remember the warmth and comfort, the lavender headache pillow and just-in-case-of-barfing tupperware and the extra blanket, securely tucked. Maybe they could taste Noodles and Eggs as I did when I was a kid—the taste of comfort and security, of home, untainted by worry. Maybe what looked like refuge to me, a port in a storm, could be plain, simple comfort to my kids. 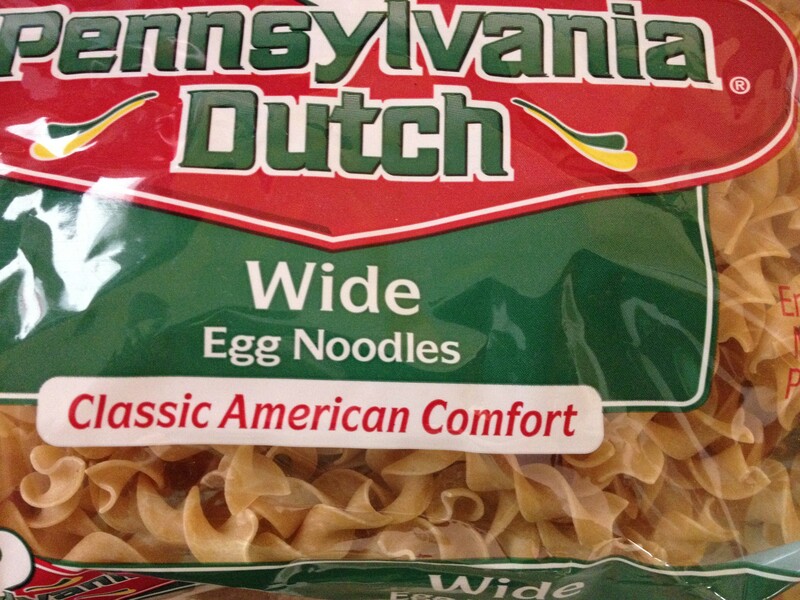 I interviewed my mom to give you the lowdown on Noodles and Eggs. Apparently they come from my grandmother Martha Shine, her mother-in-law. “I think she just told it to me,” Mom says. “I’ve heard other people make it where you let the noodles get really hard and crunchy, and then flip it like a pancake. But I like our way better.” Sometimes you do get some crunchy noodles in there, from their time in the hot butter. Oh, and these were always the side dish with boiled kielbasa. I’d forgotten that part, probably because I wasn’t a big kielbasa fan as a kid. (I would totally endorse this idea now!) Mom remembers the kielbasa, I remember the applesauce. Boil noodles according to package directions. You want to get past al dente, but not all the way to soup. Drain and rinse under cold water. Melt butter in a large skillet. 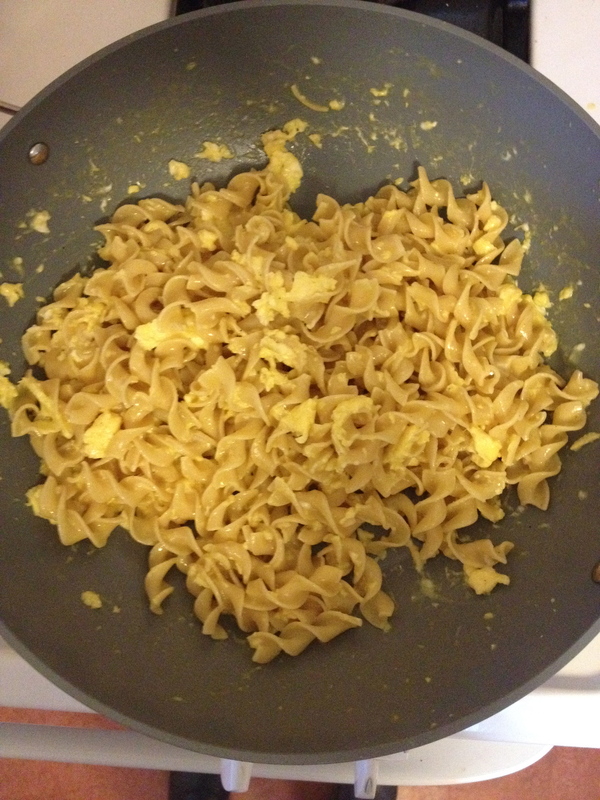 (Next time I am going to save a pot and just melt the butter in the dutch oven where I cooked the noodles.) Add the noodles and stir over medium heat, warming them and sprinkling them with garlic salt. Serve immediately with applesauce on the side, and boiled kielbasa if you have it.